Are you not able to play your favorite games because your Xbox One won’t turn on? Or your Xbox one power supply is making unbearable noise? Well, it happens with many gamers including me. And, in most cases, the problem is a damaged power supply. So, today I am sharing the list of best Xbox one power supply you can buy in 2019. Along with that, I have got a tutorial on how to replace Xbox One power supply successfully and the things you need to check before buying. So, let’s begin! 3 Xbox One Won’t Turn On? Here’s What to do. 4 How to Fix Xbox One turning off Unexpectedly? 5 How to Prevent Power Supply Issues on Xbox One? As I mentioned, a faulty power supply (often called power brick) is one of the major reasons for your Xbox One not turning on at all. And without a power supply, there is no way you can turn your Xbox one. For absolute beginners, let me explain what an Xbox power supply really do. The Xbox consoles run on direct-current (DC) power while the electricity we get in our homes is alternating-current (AC) power. 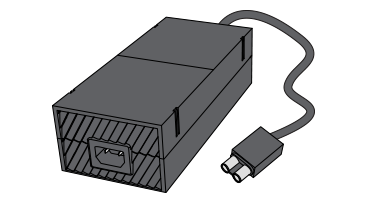 The Xbox One power supply/adapter converts the power from AC source to DC power and reduces it to suitable power on which your Xbox console operates. Before we go to the list of top Xbox one power supplies of 2019, let me give you a glimpse of the most common problems with Xbox one power bricks and cords. Power Brick: The Xbox one power supply has a brick that houses the main circuitry along with a cooling fan, fuse etc. In case of power surges or fluctuations, this fuse protects your Xbox one from any damages. In such situations, the fuse blows off. The problem is you cannot replace this fuse, therefore a new power supply is required. Also, if the cooling fan stops working, it is a wise decision to replace the power supply otherwise it will heat up and damage your console. 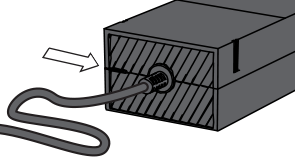 AC / DC Power Cord: The hard-wired cord that connects the power brick and your Xbox one is the DC power cord. While the cord that is plugged into the wall socket is the AC power cord. Many times we accidentally walk over the cables; sometimes they get exposed to heat sources, or wrapping the cord around the power brick can cause damage to Xbox one power cords. As a result, either you have to swap the cord with an old cord or buy a new Xbox one power supply. Noise: For one or the other reason, the Xbox one power supply starts making noise that starts with a slight buzz and goes on to increase to unbearable levels. Normally, there is no solution to this problem other than spending some money and get yourself a new power supply for Xbox one console. If you are also facing any such problem with your Xbox One console, you need a good power supply. So, to help you choose from all the options available in the market, here’s the list of best Xbox one power supply of 2019. Check it out! Recommended: Looking for a stable power supply for your PC? Check out my list of Best power supply for gaming pc of 2019. I know that you only need one power supply and there are too many options to choose from. Don’t worry. In the next section, I have reviewed all the top 8 Xbox one power supply individually including their pros and cons. I am sure you’ll find a power brick / supply that will fit in your budget and still meet all your expectation very well. So, let me start with the most popular Xbox one power supply for you and further we will see the best budget and few premium options as well. 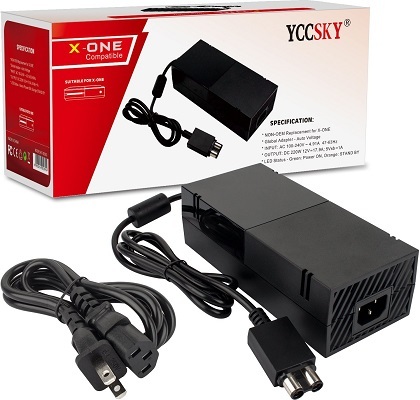 So, the very first one on our list of the best Xbox one power supply is YCCSKY Xbox One Power Supply. With excellent features and more than 2000 reviews on Amazon, this power supply (also called AC adapter) is a great choice for your Xbox One console. As I mentioned, Noise is one of the most common problems with Xbox one power supply. To tackle this problem, this advanced quiet version of YCCSKY Xbox One power supply is optimized for lowest possible noise while operating. When I tried the same with my 1-year-old Xbox one console, the noise was barely audible. The build quality is good that makes is durable. The best part about the YCCSKY Xbox one power supply is the Global Adapter support. As you know different countries have different power source voltages used in household circuits. YCCSKY Xbox one power supply runs on the auto voltage technology which makes it compatible with any power source in any country. It can automatically adjust between 100 – 240V power source without getting damaged. The cooling fan inside this Xbox one power brick is designed specifically to prevent overheating as well as produce lesser noise. Also, there is an LED indicator in the power brick to display the power status of your console. Another plus point about this Xbox one AC adapter is the special IC switch that prevents the console from being over-charged, over-heated or short circuits. So, you do not have to worry about battery life. All this comes at an affordable price too; that makes YCCSKY Xbox one power supply the best option for replacing your current power supply. In case you are looking for a branded option, Ortz brings you a premium Xbox one power supply with good quality and longer life. The Ortz Xbox One Power Supply (Enhance Quiet Version) is one of the top rated replacement for your current Xbox one power supply. Build with special internal circuitry, this power supply ensures steady charge for your Xbox One console. It prevents from overcharge and overheating so that you can focus more on gaming and less on worrying about your power supply. 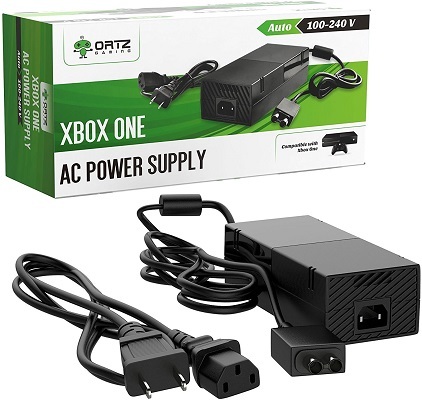 Talking about the compatibility, Ortz Xbox One power supply is 100% compatible with rated for Xbox One. It works right out of the box; just plug in and start playing your favorite Xbox one games. Even after using this power supply for few hours of gaming, it works smoothly with just a little buzzing sound. There is just one point of concern before you buy Ortz Xbox one power supply. Make sure you are buying a variant that is rated according to your household power source otherwise there can be issues like noise and overheating. Apart from this, Ortz Xbox one power supply is a great option if you want a sturdy and silent power supply for Xbox one console. What else could be better than the Original Microsoft Xbox One Power Supply, right? Well, yes. But you must be wondering why it is on the third position on our list of the best Xbox one power supply. Actually, this very excellent Xbox one adapter will be a bit heavy on your pockets; that’s why it is not our top choice. Otherwise, if you talk about the specifications, you will get a standard 100V / 2A input AC power adapter including the power cord cables and brick style power supply. Being a genuine Microsoft Xbox product, you can expect premium quality. There is very insignificant noise from the power supply brick and heating is not an issue once you fit this power supply to your Xbox console. You need to worry about compatibility as well, because this an official OEM power supply and it is tested to work flawlessly on any Xbox One console. Also, Microsoft warns the gamers not to use any third party components to maintain the performance of their Xbox consoles (though, there is no such performance degradation practically). Obviously, it is the best Xbox one power supply in the premium category. I would suggest to go with this Xbox one power supply replacement if you want an official product and can afford it. 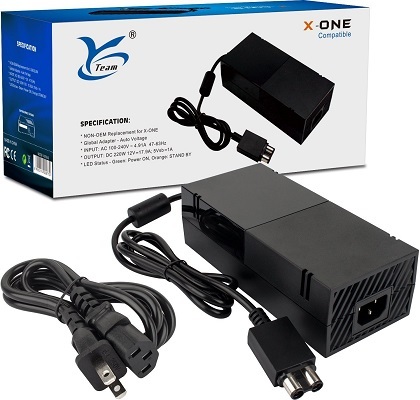 The YTeam Xbox One AC power adapter is an excellent replacement for your old or faulty power supply. With a slightly higher price, this one gives a plethora of safety features to prevent the power supply as well as the Xbox console form any kind of power failure. The power brick comprises of a premium fan that permanently solves the common issue of loud noise. Also, a high-grade material is used to build this product, making it durable even in unfavorable situations. The best part about YTeam Xbox One advanced power adapter is the innovative IC switch used to prevent over-charging, over-current, short-circuit and other power related issues. All that makes it suitable for long and continuous use without having to worry about power interruptions. It is a National Certified power adapter with Input voltage rated at 100-240V ~ 4.91A 43-63Hz. Auto voltage feature is present to make sure you can run any Xbox One console in any country using YTeam Xbox One power supply. Just like the other ones on this list, it also has an LED indicator so that you can always have an eye on the power status of your Xbox console. It comes with US version standard power cord for maximum compatibility across the western countries. But for Asian countries, you will have to get a compatible spare AC cord. YTeam gives a 30-Days Money back guarantee along with 12 months warranty to ensure that you get the best possible product and service throughout. 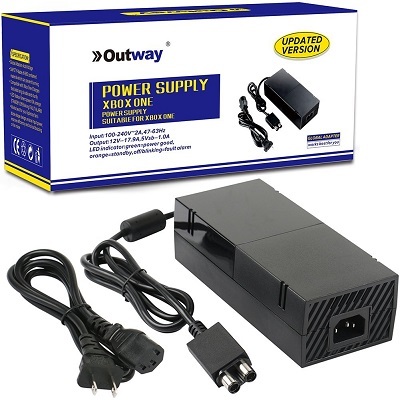 Coming at number four on our list is the Outway Xbox One AC Adapter/Power Supply. Outway has a decent market reputation as a brand and specializes in making Xbox console power supplies (both Xbox one and Xbox 360). The new updated version of Outway Xbox one power supply features a combination of upgraded fan and circuitry that allows maximum performance at low noise. The upgraded fan also ensures optimal cooling in the power brick to avoid issues that occur due to overheating. If you’re previous power supply just burned away, rest assured because Outway Xbox one power supply is made with ABS contained material that prevents it from burning or catching fire. Just like the YCCSKY power supply on the top our list, this one also comes with a Global Adapter. That means it can adjust to the Input Voltage supply from 100-240V allowing it to work worldwide in any country without any hassle. Another handy feature about this is that the power brick comes with LED indicator that provides the status of the power. If there is a steady green light, it means you’re good for a gaming marathon. Orange LED light means the console is on standby while OFF or blinking LED denotes there some power fault in the brick. So, if you are looking for the best budget Xbox one power supply, this one should be a good choice. Also, you will get a 12 months manufacturer warranty with this purchase. 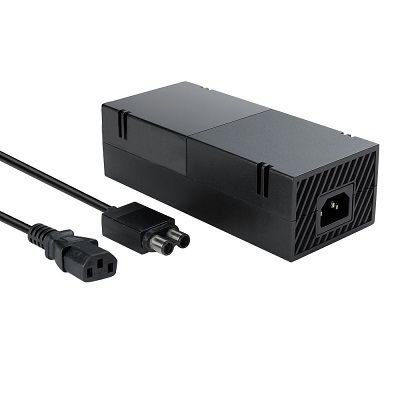 If you are looking for an absolutely silent power supply, you might want to go with YCCTeam Xbox One Power Supply. It’s the latest version is really quiet and performs well enough for your Xbox gaming experience. With optimized motherboard, you can expect a longer lifespan even after continuous hours of gaming. It also prevents any excessive heat, thanks to the great improvements made in the cooling fan of the power brick. 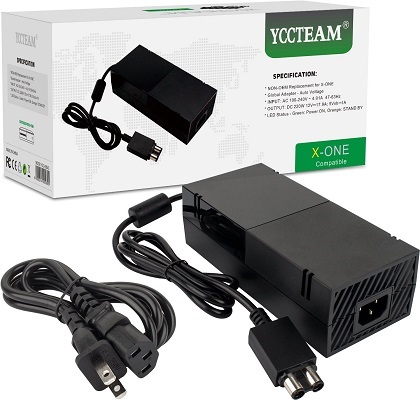 YCCTeam Xbox one power supply comes with Universal AC Adapter that allows it to adjust to different voltages between 100-240V automatically. So, there is no need to worry about whether it will work with your household power source. You can travel or migrate to any country with your Xbox console and enjoy uninterrupted gaming. Though, you will need an AC cord with the right number of prongs to fit into the wall socket. This Xbox one power adapter also has Dual LED indicator with green light meaning the power brick is working fine while the orange light means it on standby. All in all, it is the quietest Xbox one power supply available in the market as a replacement of stock Xbox one power supply. YCCTeam also comes with 12 months manufacturer warranty and the customer service is exceptionally great. The next one on our list is Masione Power Supply for Xbox One console. With professional design and precise components, this Xbox one adapter delivers reliable performance at an affordable price. Equipped with a radiator fan system, the power brick always remain at an optimal temperature. Remember when your Xbox would shut down unexpectedly? That won’t happen while using Masione Xbox one power supply as it operates without heating up excessively. While this power brick has optimized fan with special blade design, but it is still not very quiet like the previous one. But don’t worry, the noise is almost inaudible instead of a loud buzz. 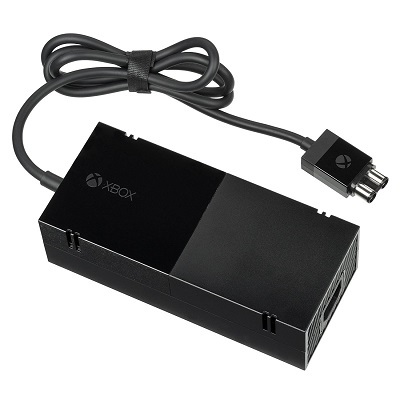 Its Auto voltage feature allows this power adapter to be used with any Xbox one console worldwide. It is electrically rated at AC 100 – 240V, 50/60Hz Input voltage. The output voltage is rated a 12V DC 220W high power for rapid charging experience. You will get US plug along with this power supply which is quite standard in almost all the western world countries. Talking about the quality and performance, it’s great and you can try it out yourself because the manufacturer is offering a 30-Days Money back guarantee and 1-year warranty. So, if you want to get your hands on an affordable Xbox one power supply that does not compromise with quality, go for Masione Xbox one power supply today. If you are not a regular gamer and looking for a cheap option, Sumlink Xbox One power supply is what you can get and enjoy occasional gaming. Let me tell you this one is not meant for frequent gamers who play for long hours. 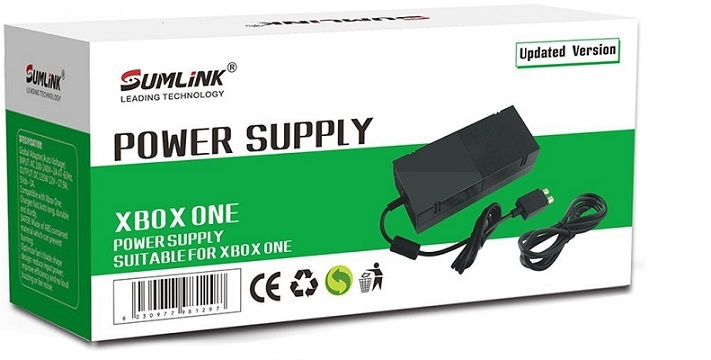 Sumlink Xbox one power adapter offers almost everything but the quality is just satisfactory. You will get a global adapter, ABS material build, a nice fan and LED light status indicator. 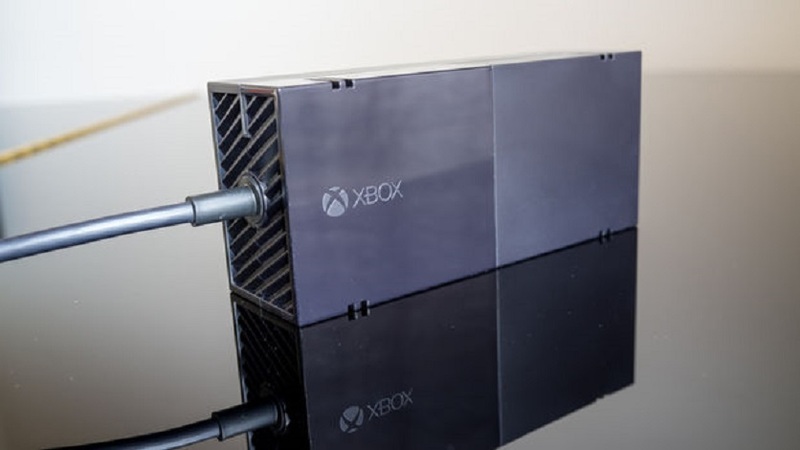 The plus point about this Xbox one power supply is the optimized fan blade design that reduces noise; there’s just a normal buzz when you hear closely. It also reduces input power as well as improves the overall efficiency. For better heat dissipation, there are vents on both front and the back end. Also, the ABS material makes it fire resistant. Considering everything, Sumlink Xbox one power supply is a good secondary option when you do not want to spend extra money as an occasional gamer. Xbox One Won’t Turn On? Here’s What to do. If you are not sure why your Xbox one is not turning on, you can follow these simple steps to check the power supply of your Xbox one and find out if you need power supply replacement. As I mentioned earlier in this post, your Xbox one power supply has a surge protector which actually prevent your power brick from any electric damage in case of power surge by cutting out the electric power. When such a thing happens, the Xbox one power supply isn’t permanently damaged but to get it running again, you need to reset it. Following are the simple steps to reset Xbox one power supply. Unplug all the cables including DC Cord, AC Cord from the console as well as the wall socket. Wait for 10-20 seconds. The power supply needs at least 10 seconds to reset. Now, plug in the AC cord in the wall power source but DO NOT connect the AC cord to the Xbox console yet. Check the LED Light on the power supply. If the light is ON, then plug in the DC cord and connect to the console. Check the light again. If it is still ON, then press the Xbox button on the console and your Xbox should start successfully. If this doesn’t work, then you need to check the LED indicator to get an idea what the matter. Here’s what to do next. The LED indicator on Xbox power brick shows the power status of your console. There are a number of states of the LED light that indicate different electrical issues with your power supply. First of all, make sure the power cord is plugged firmly to the console as well as the power socket on the wall. Now, check for the LED light. Steady white light: Good news! Your power supply is perfectly fine. A steady white light means that the power brick is receiving electricity from the wall socket and supplying it to your console without any error. In such a situation, you need to check with your console. Steady orange light: Take a sigh! Your Xbox one power brick is okay but its just set to energy-saving mode. You can fix it by following the steps in the next section. LED off or flashing orange light: In this case, your power supply has problems and you must try resetting the power supply using the steps that I mentioned in the previous section. If that fails, you need an Xbox one power supply replacement. Most of the Xbox one users have at least once complained about this issue and if you are one of those, I have got your back. Many times, when you plug in the power supply, the LED lights up in white and immediately turns into steady orange light. This happens when your console is set to power-saving mode. In such a situation, the power brick is not supplying electricity to the console. And, there’s an unusual but working fix for this! Here’s that. 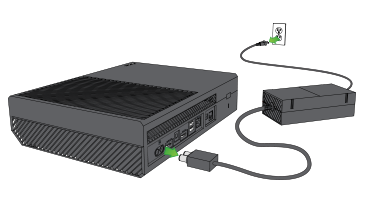 First of all, remove the cable that connects the power brick to your Xbox One. Then, unplug the cable from the power brick end that goes into the power socket. Do not touch anything else. Now plug the power cord that runs from the brick to the power adapter into the wall socket. Now plug the other end of this cable into the power brick just halfway in slowly until a crackling sound comes. Try wiggling the cable a little, go back and forth a couple of times and the LED indicator must change to steady white. Switch on the console and the console should work properly. How to Fix Xbox One turning off Unexpectedly? Another common problem with Xbox one users is when the console turns off unexpectedly. It gets completely irritating when this happens during an important gaming session. Isn’t it so? Well, there are some simple solutions that can help you fix your Xbox one from turning off in the middle of a game. Here you go! Due to overheating, your Xbox One sometimes shuts down to prevent any power failure. There are a couple of reasons for overheating such as a faulty internal fan or dust build-up inside the power supply. To prevent your Xbox One from overheating, you must place your Xbox one console and power brick in a cool place with proper ventilation. Avoid placing it behind shelves or any secluded area. Also, make sure that the internal fans are not blocked by the surroundings to allow the heat to escape properly. As a preventive measure, Xbox One also gives you a prompt that your console is overheating. Whenever you see such a prompt, just turn off the console and don’t turn it back on before one hour. A non-functional power supply can also make your Xbox One turn off unexpectedly. In such a situation, you have to replace your power supply with a new one. Refer to my recommendations I gave earlier in the post to buy a new Xbox one power supply. This is a sweet feature of Xbox One i.e. the Auto Shutdown mode. It allows you to set a shutdown timer after which the console will turn off automatically. But, sometimes you may forget after setting a timer and the console may turn off unexpectedly. Here’s how you can turn off the Auto shutdown mode. Open the Guide and press select. How to Prevent Power Supply Issues on Xbox One? The Instant-On mode on Xbox One enables faster start-up, voice response where available and download automatic updates. But for that, it keeps the power supply on standby mode. It means your power supply is working even after you turn off your Xbox one console. Due to continuous usage, the power supply degrades and starts giving startup errors as well as makes a loud noise. To avoid all that and help your Xbox one power supply run longer and smoother, you must disable the Instant-On mode. Open the guide and select. For safety purposes, some gamers use surge protectors or extension boxes with their Xbox One power supply. In several cases, this can affect the performance and even lead to malfunction. So, my suggestion is to always plug the power supply directly into the wall outlet. Don’t worry, the power supplies we have listed above come with inbuilt surge controller; so technically there is no need for unnecessary wiring. This is a very simple yet effective practice to prevent any malfunction in your Xbox one power adapter. Actually, both the console box as well as the power brick has moving fans meant for cooling. You must place the console and the power brick in a way that the fans are in the correct orientation and the heat vents are not blocked. Avoid resting the power supply or the console itself on an unstable or movable surface. So, that was the list of top Xbox one power supplies that are available in the market in 2019. Now, before you make choice I would like you to go through a few important things that you must consider in an Xbox one power supply. Compatibility: Though all the mentioned power supplies in this list are 100% compatible with Xbox console, in case you are looking for some other options as well, you gotta double check the compatibility. Make sure you are buying a power supply designed for Xbox One because the power supplies are not cross compatible between different Xbox consoles like Xbox 360 and Xbox One S.
Power Rating: The power rating specifies that what should be the correct Input and Output power for optimal performance and risk-free operation. The Household power supply is different in different countries. Generally, when you buy from a brick-and-mortar store in your country, they will only sell the Xbox one power supply which has a power rating according to your country. But while buying online, always check the Input Power Rating is the same as the household power supply that you get in your home. Build Material: Another important thing to consider is the material using which the Xbox One power brick is made. As you already heating major issue and it could burn down the power brick at times. Make sure that the power brick is made with ABS material that prevents your power brick from burning and eliminates any chance of fire. It also ensures better durability and longer life. So, my fellow Xbox gamers, I hope you must have found your best fit for your console from our list of best Xbox one power supplies of 2019. If you still have any confusion, let me brief it for you in simple and straight words. The YCCSKY Xbox One Power Supply is the overall best Xbox one power supply while the YTeam Xbox One Power supply is the best budget Xbox one power supply. In case you want a premium and original option, Microsoft Original Xbox One power supply is your option. Share your views about your experience with aftermarket Xbox One Power Supply. Have you seen a difference while gaming as compared to stock Xbox one power supply? Tell us in the comments section below. Did I miss anything? Feel free to discuss in comments as well. If you find this post helpful, please share it with your friends who love gaming. Keep visiting for latest gaming news and product reviews. Xbox One Elite Controller Review: DON’T Spend Extra on It! I’ve never been keen on aftermarket products like these. How reliable are they vs the original power supply? Hey Joshua, I can understand you concern regarding aftermarket products. But, as far as the Xbox one power supplies that I have mentioned in this post (aftermarket as well as original) are concerned, all of them are tested by myself and they offer a great alternative of the original xbox one power supply in terms of performance; that too at an affordable price!